Managing Tourist Health is a seminal study which combines a range of state of the art reviews of the issues facing tourism managers and professionals in the fast growing area of tourist health and safety. An international range of contributors, each a specialist in their chosen field, have written papers for this book to explain many of the complex issues affecting tourists, the tourism industry and governments in ensuring tourism is viewed as a safe and enjoyable experience for all. The contributors have a wealth of interdisciplinary experience ranging from medicine, law, tourism research, safety science, ergonomics, management, consultancy among other cognate areas of study. Future research directions are examined in many of the chapters together with current state of the art knowledge in relation to key studies. The editors have worked in this area of research since the late 1980s and have accumulated a wide range of academic, professional and consultancy experience for governments and the private sector. The book extends this understanding through a multi-disciplinary perspective combining some of the leading researchers who have published in this area since the emergence of tourist health as a legitimate area of study in the 1970s. List of figures. List of tables. Contributors. Dedication. Foreword (F. Moore). Acknowledgments. Introduction. 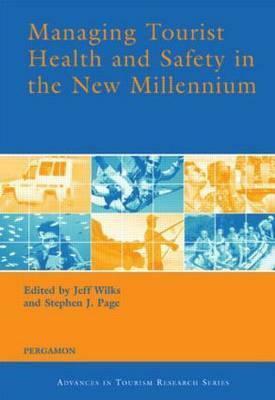 Current status of tourist Health and Safety (J. Wilks, S.J. Page). Travellers' health - an epidemiological overview (J. Cossar). Evaluating the nature, scope and extent of tourist accidents: the New Zealand experience (S.J. Page et al.). Risk acceptance in adventure tourism - paradox and context (C. Ryan).Current status and future directions in the adventure tourism industry (A. Ewert, L. Jamieson). Managing tourist safety: the experience of the adventure tourism industry (T. Bentley et al.). Current issues in travel and tourism law (Trudie Atherton, Trevor Atherton). Travel agents' health and safety advice (J. Wilks et al.). Safety and security for destinations: WTO case studies (J. Wilks). International tourists and transport safety (B. Prideaux). Towards a framework for tourism disaster management (B. Faulkner). Biting midges and tourism in Scotland (A. Blackwell, S.J. Page). Tourist safety and the urban environment (M. Barker et al.). Risks, rights and responsibilities in tourist well-being: who should manage visitor well-being at destination? (L. Walker, S.J. Page). Subject index. Author index. List of figures. "An essential addition to the exclusive international portfolio of standard textbooks in tourism health and safety, edited by tourism professors with exceptional credentials." Travel Medicine and Infectious Disease, 2003. Stephen Page is Senior Professor of Sustainable Tourism Management at London Metropolitan Business School. He has worked in the UK, New Zealand, Australia, Ireland and France and has written, edited or contributed to 33 leading books on tourism, a number of which have been sponsored by the tourism sector. He has worked with many private sector and public sector agencies on tourism consultancy in terms of tourism and leisure strategies, feasibility studies, problem-solving including high profile projects such as the Channel Tunnel and Auckland's Sky Tower in New Zealand. He is also an editor of the top Tourism journal, Tourism Management published by Elsevier and Series Editor of the Elsevier Advances in Tourism Research Series. He is a regular contributor to industry conferences and meetings as a speaker on industry-related topics and has been ranked as one of the top Tourism academics in the UK based on publications in the top three Tourism journals for the 5 year period 2003-2008.